Clutch-PC. The MSI S100 is the perfect PC perfect for travellers because it's light, low-cost and well-protected. 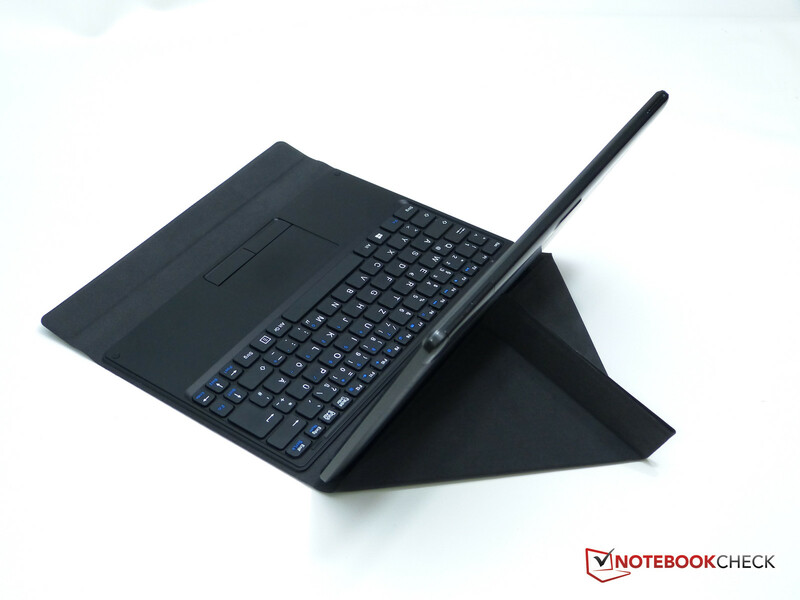 The included case includes a usable keyboard too. 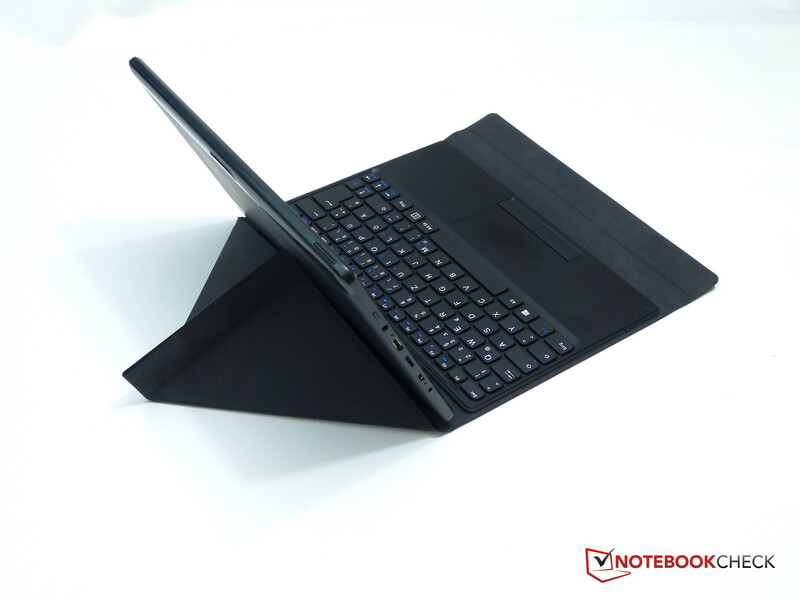 So where are the limits of this low-cost 10-inch 2-in-1? Read our review to find out. 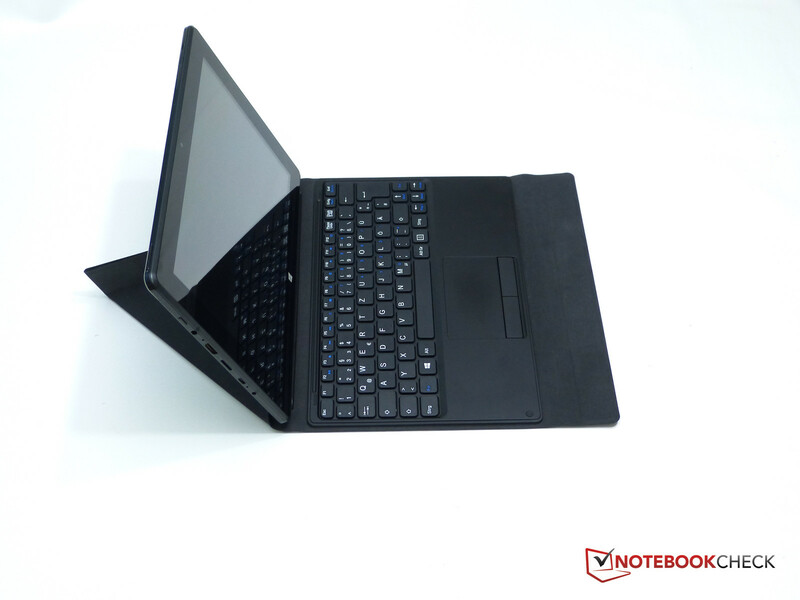 The MSI S100 is a 10-inch 2-in-1 targeted at the low-cost portability market. 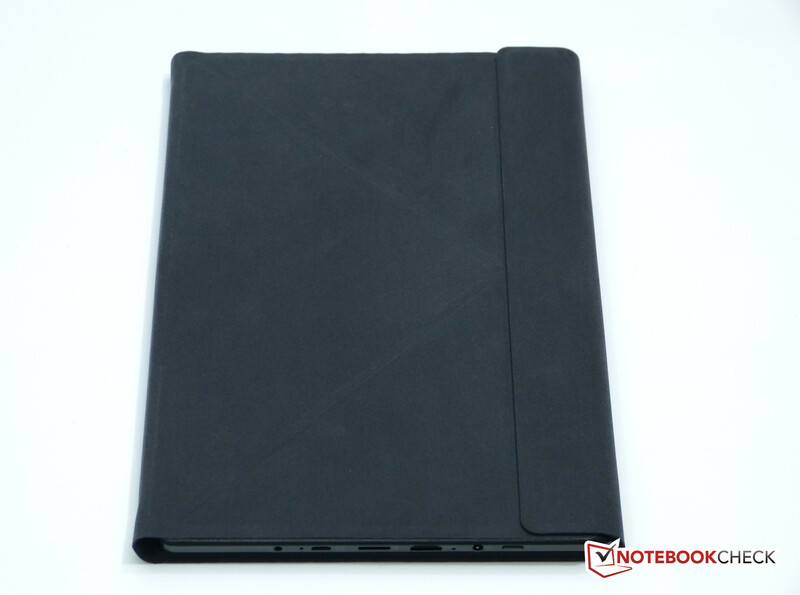 This tablet-first design comes with a keyboard case that doubles as a stand and gives a good level of protection in under 2.2 pounds / 1 KG of weight. 64GB of storage means there's enough space for game installs, music and less disk-housekeeping. There are two 'cases' to talk about with the MSI 100. 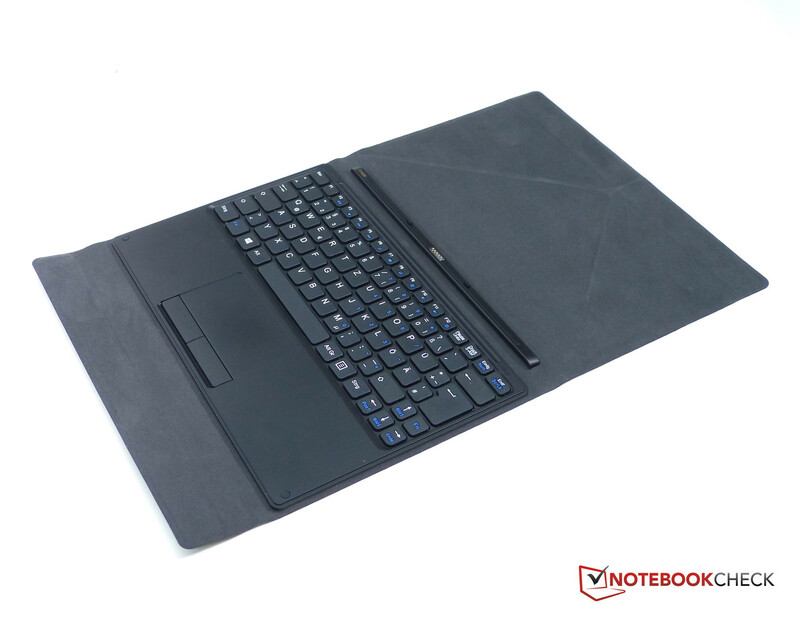 The tablet casing itself is one thing but it must not be underestimated how much of an advantage an integrated case-cover is. It's going to protect the investment. Cases and keyboards usually add 200-300 grams to a device too so to have the whole package coming in at under 1 KG / 2.2 pounds is a big advantage in terms of portability. 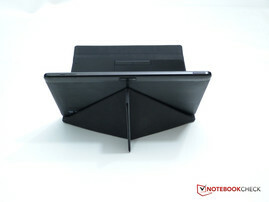 It's a soft felt-finish case with an origami-style stand that holds the tablet at a single angle. The downside of this setup is the area required and the lack of stability. You won't be able to place the unit on the average airplanes seat-back table, you won't find it stable enough to 'lap' and you need to fold the case around the tablet for one-handed carrying. Once closed though the case is grippy, compact and stable. For more information on the keyboard see below. 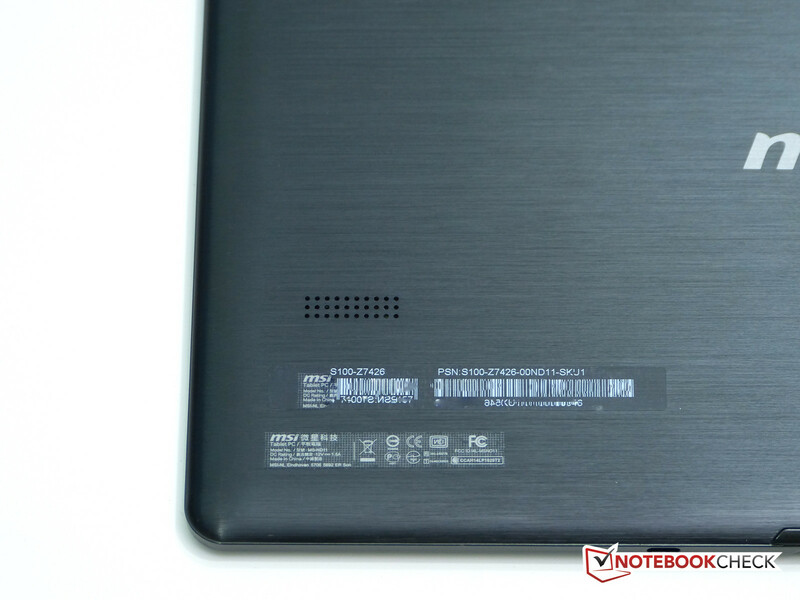 The tablet casing itself is metal-backed and appears to be well-constructed. It's a bit thicker than many Android tablets but you've got a comparatively good selection of ports around the unit including mini-HDMI and micro-SD. 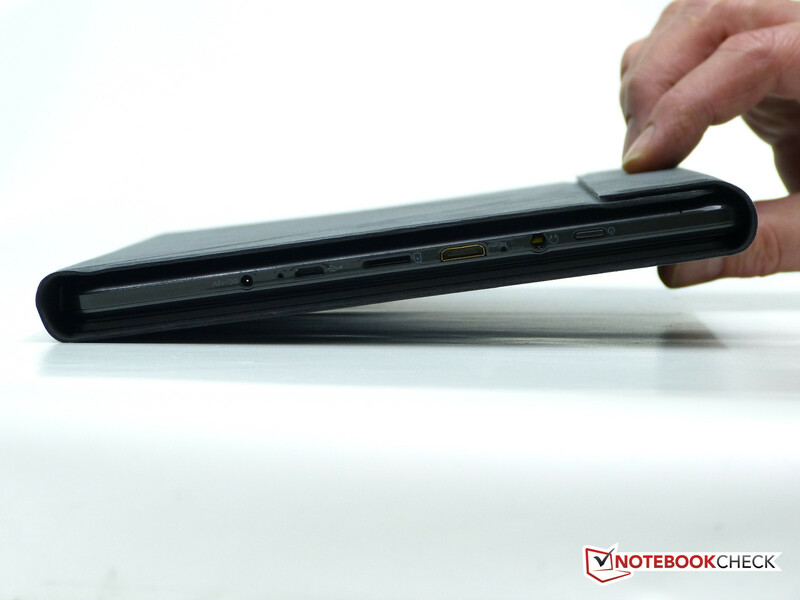 There's a separate charging port and micro-USB too so docking to a monitor for long-term working is possible. There's no easy access to the internals, no fan and a single speaker port. 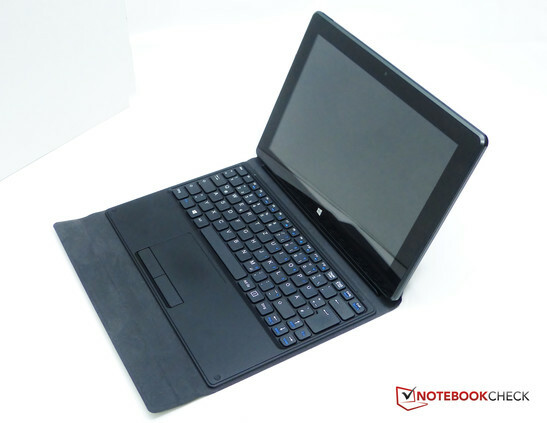 The keyboard is connected via a ball-pin connector on the base of the unit and on the top-right of the tablet you'll find a blanked-off panel which is presumably for 3G/4G-capable units. 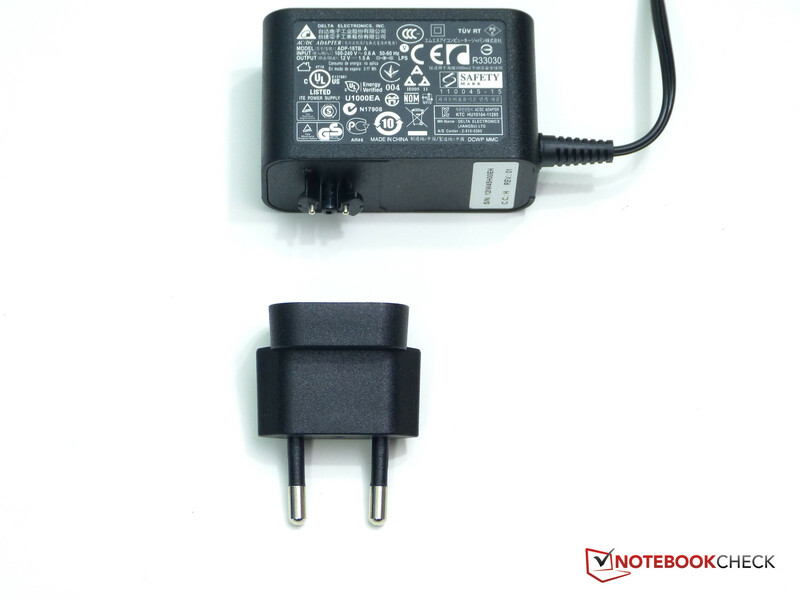 External-facing mini-HDMI (not Micro-HDMI as often found on small Windows tablets,) micro-USB 2.0 (adapter cable provided,) Micro-SD, headset and charging ports are available and they cover the basics of PC connectivity. The proprietary ball-pin connector for the keyboard can't be used for anything else but the keyboard case. LAN connectivity would require a USB-Ethernet adapter (tested OK) and it would be possible to add a USB docking station via the USB. We tested a Belkin USB 3.0 dual-video docking station with DVI output, a keyboard and mouse and Gigabit Ethernet port and wrote this section of the review using the setup. While the setup is OK for textual-based work it does come with a CPU overhead of 6-15% and a reduction in video frame-rate quality and is not recommended for long-term desktop work. The WiFi module will support Miracast screen sharing but we didn't test that. NFC and TPM are not included. There's no integrated file system encryption as found on some low-cost Windows 8 tablets. The keyboard-case is an interesting addition for the price and it was surprisingly comfortable to use with good key travel, low-noise and good mouse buttons. The touchpad does not support multi-touch or gestures. The, approx, 2/3rd sized keyboard is slightly cramped and requires getting used to and a higher level of concentration than full-size keyboards. Those with larger fingers fingers will have to use more of a 'pecking' style but if you're used to smaller keyboards and have slimmer fingers it might work well for you. We found one issue with the right side of the space-bar which doesn't register as it does in the middle. It means you'll have to adapt for a heavier thumb action or move the thumb towards the middle of the space-bar. It might be a one-off issue on our test model and it's possible that it loosens up over time. You can see the problem demonstrated in this video. 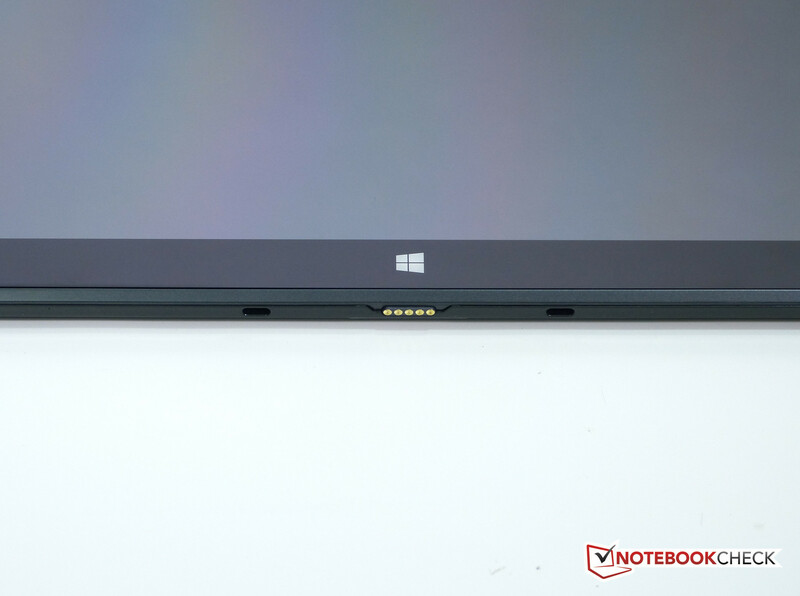 The touchscreen supports 10-finger touch and dragging a Window across the touchscreen demonstrated that there are no issues here. The relatively low resolution means that finger-control on the desktop is not as bad as it could be with a high-resolution screen. The tablet is light enough to hold for casual browsing and can be located into the keyboard case which provides a origami-like stand. It requires a large surface area though and isn't very stable so it's not suitable for a lap or a small seat-back table. 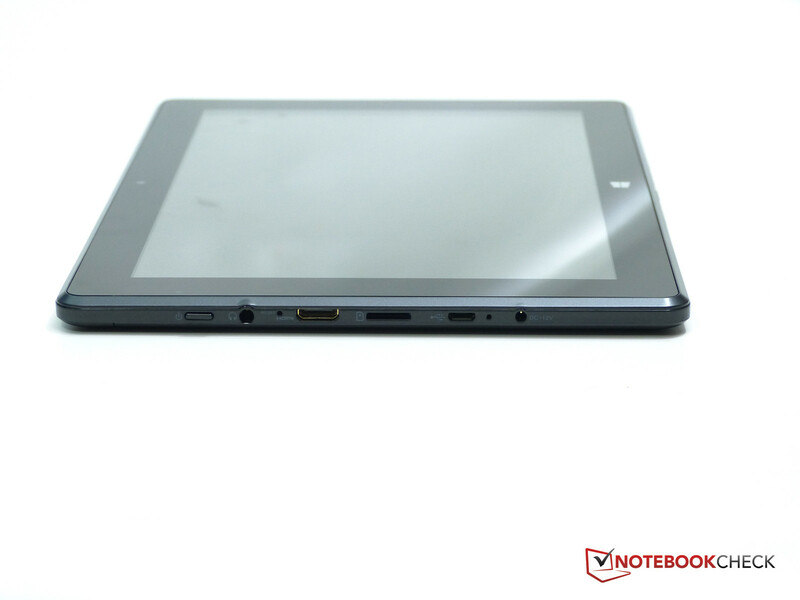 The 1280x800 pixel IPS display module is average for the class of device. We've seen much worse on a 10-inch touchscreen (the Lenovo Flex 10 comes to mind) but there are color and brightness issues to consider. One advantage of the smaller resolution is faster framerates on games and the lower maximum brightness means a little less stress on the battery. We felt that the display brightness and color was acceptable for indoor casual usage but if you require higher brightness there are better solutions available. 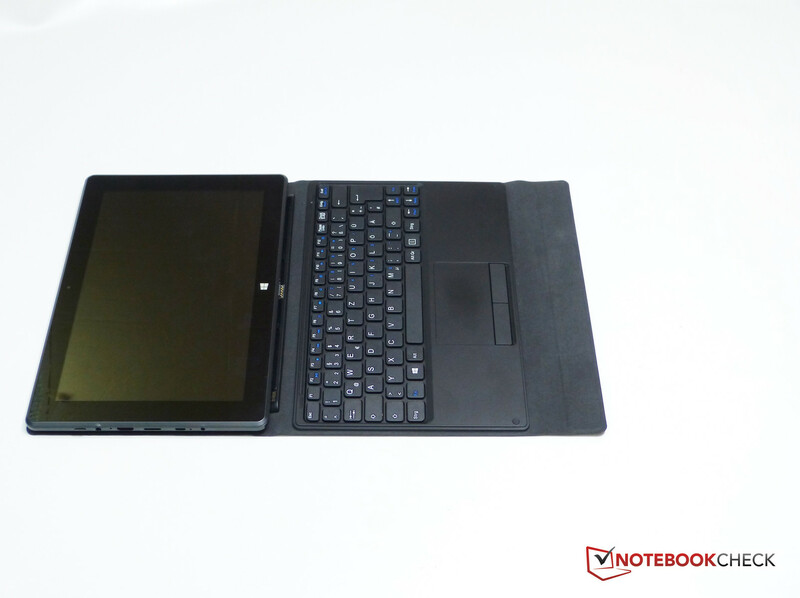 The Acer Aspire Switch 10, for example, has a much better maximum brightness and much better color. As a video playback device the MSI S100 isn't as punchy as it could be which is a shame as there's enough storage in the unit to house a good library of videos for offline use. 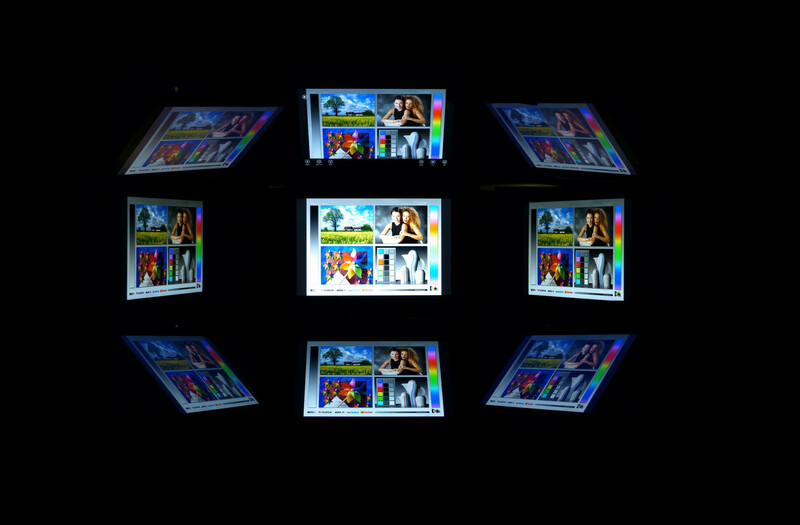 Note that the screen is glossy. 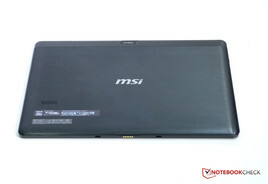 The color accuracy on the MSI S100 screen is not good and brightness is poor, especially for usage in bright rooms, beside windows and outdoors. 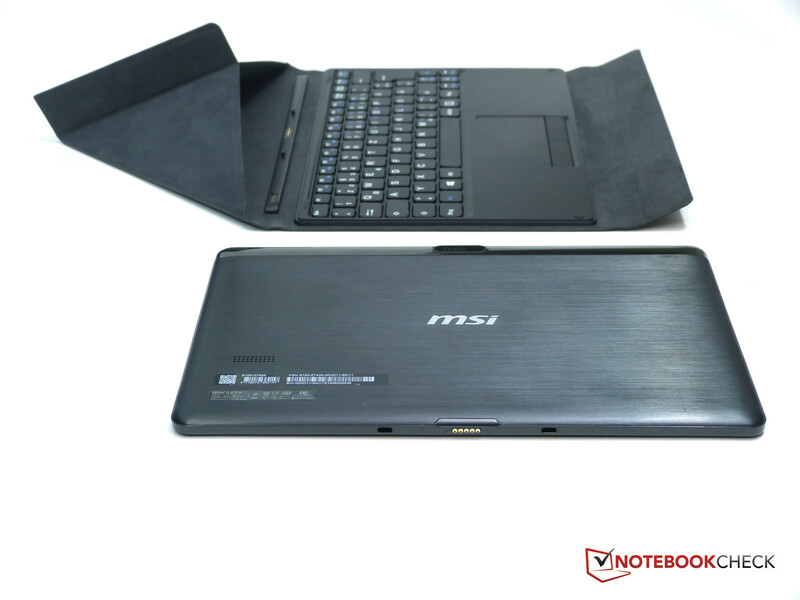 Due to the low screen brightness the MSI S100 is not recommended for outdoor usage. 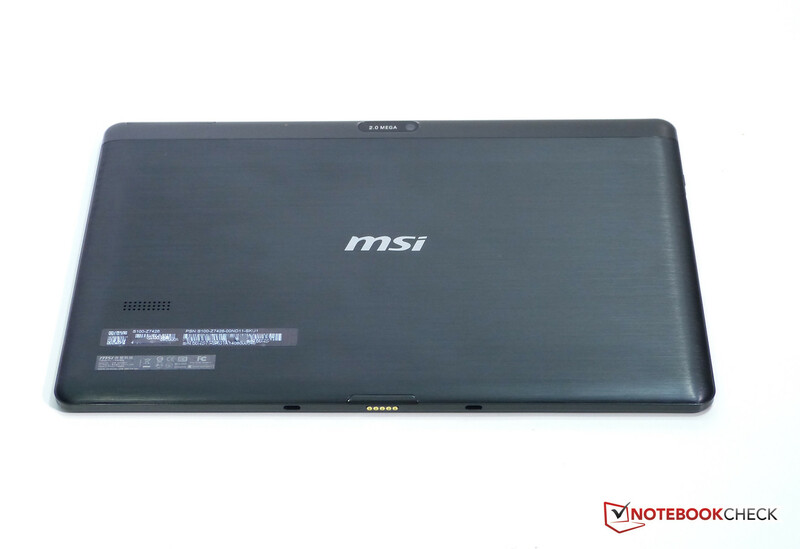 The MSI S100 is equipped with a quad-core Intel Z3740D with a Turbo Boost that takes the nominal 1.33 Ghz clockrate up to 1.83 Ghz. Unfortunately in our review model there appears to be a problem because we haven't been able to measure any clockrate above 1.33 Ghz. Turbo Boost, an important factor in the performance of the device, is not available. As a consequence we have to report that performance levels are way below what we would expect on this platform. We check performance settings un der Windows and as this is a Connected Standby-enabled PC there's no clockrate setting available. There's no 'switch' in the BIOS and even a BIOS upgrade or full reset didn't fix the problem. 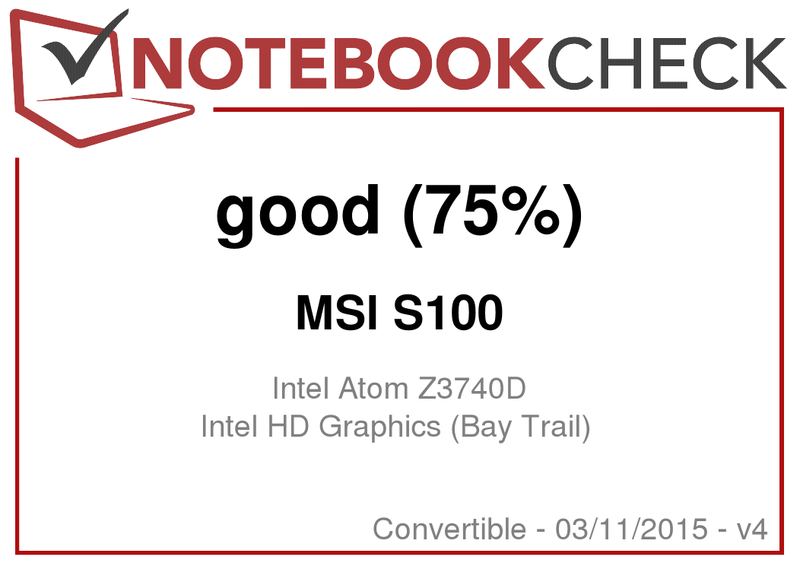 In theory the MSI S100 should perform exactly as other devices in the same category; For example, the Acer Aspire Switch 10. We've added the benchmark figures below as a reference point and will update if we are able to unlock the CPU Turbo Boost in the near future. The Intel Atom Z3740D quad-core processor is one of a large number of variants in the Baytrail-T processor family. Variations between the individual processors is not huge but the Z3740D would sit in the middle of the range. It supports Microsoft InstantGo, Intel Quick Sync, WiDi and other features. As mentioned, our sample here appears to be locked at 1.33Ghz with no active Turbo Boost which we will assume is not intended by MSI although none of the marketing literature we looked at mentioned anything other than 1.33Ghz. 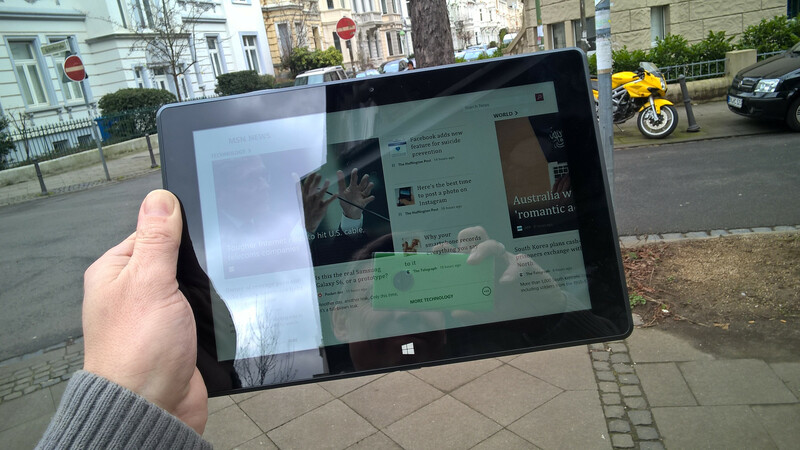 There seems no logical reason to disable Turbo Boost on this relatively large Windows tablet design. Overall performance is OK and certainly acceptable when in Windows 8 Metro apps. 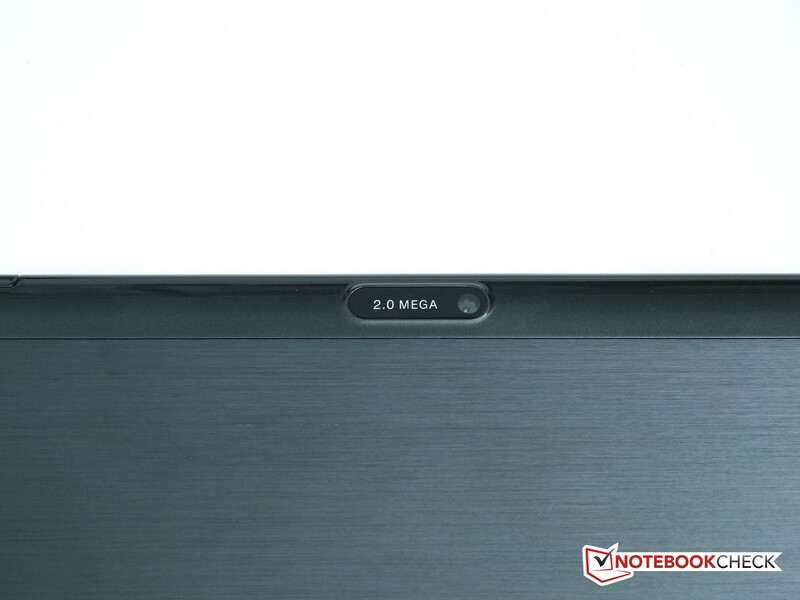 The PCMark 7 figure of 2151 is slightly short of some of the other offerings in this sector and although the Lenovo Miix 2 10 is around 20% fast in a computational result, the MSI S100 almost keeps up with the ASUS X205. We feel there's a lot more to be had out of an 'unlocked' S100 though. Boot times were acceptable but we noticed that Windows updates took an extremely long time to install. 2GB of RAM is standard for these devices and won't be a problem unless you're running multiple desktop apps, tabs and background applications together. In that case you'll probably also find that the disk and CPU will also be a bottleneck so we don't recommend it. Our AS SSD test failed but we've included the CrystalDiskMark results below for the important sequential read speeds (good for the category) and the 4K write speeds (average for the category.) We've put the Surface Pro 3 result in too and you can see that on this desktop-capable Ultrabook-class device the speeds are much, much faster. The price is somewhat higher too! The basic Baytrail-T (Gen 7) graphics unit is a good step up from previous generations but still not capable of good desktop gaming. The GPU has a hardware video decoding unit so there's no heat or extreme battery drain under video playback. The 3DMark score of 200 is very low; Less than 1/3rd of the performance of a Surface Pro 3. We tested World of Warcraft and just about got an acceptable frame rate in low settings. Gaming with Windows 8 Store apps was OK though and we had fun with a number of apps from the basic Wordament to the more demanding Drift Street Mania. The MSI S100 is a silent fanless unit but the trade-off seems to be that there's a little heat build-up on the top left corner, mainly at the rear. We can't call this 'hot' but it could be annoying to some, especially in warmer ambient temperatures. (-) The maximum temperature on the upper side is 45.1 °C / 113 F, compared to the average of 35.4 °C / 96 F, ranging from 21.8 to 55.7 °C for the class Convertible. The single speaker provides a basic-quality output for short uses of YouTube, Skype and notifications. 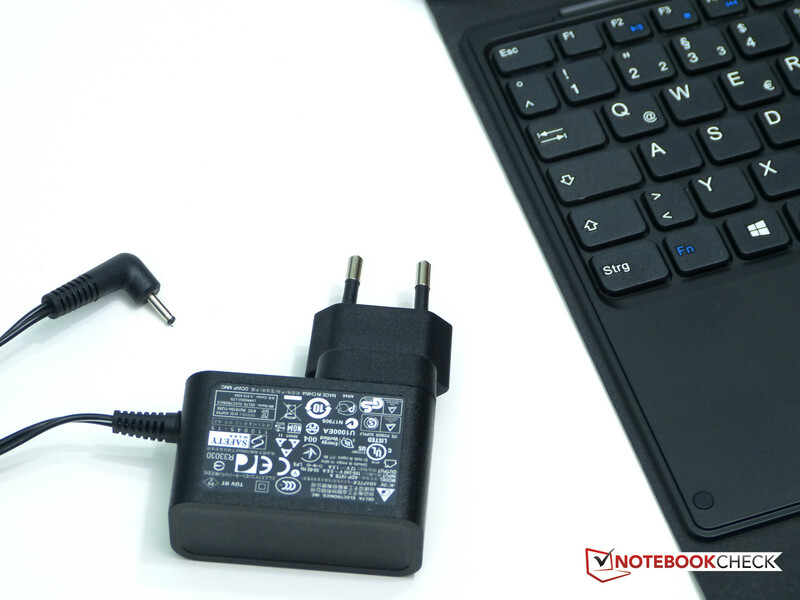 Power consumption at the wall is in-line with expectations and the battery life can be summed up as 5 hours. We measured 5 hours 40 minutes on a video playback and 5 hrs 30 minutes in our browsing test. 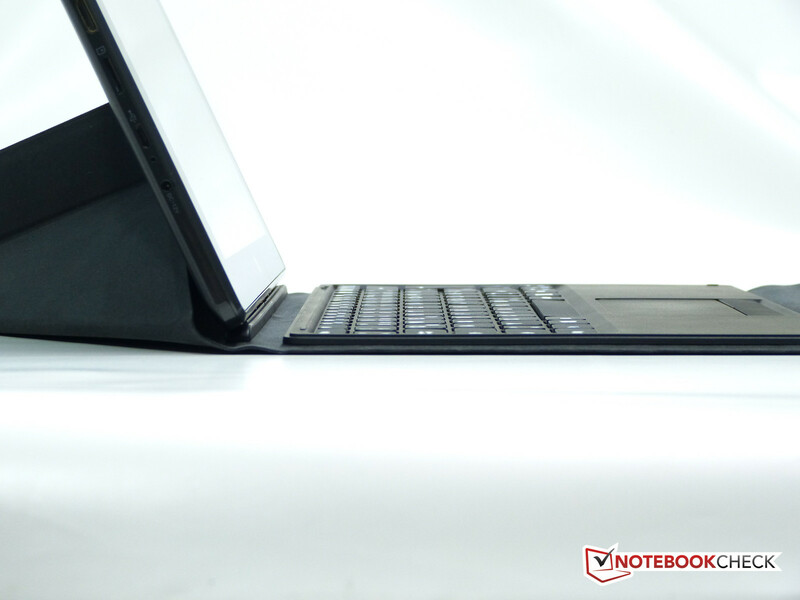 We don't expect anyone to sit in front of the MSI S100 typing for 12 hours but you could if you wanted to. 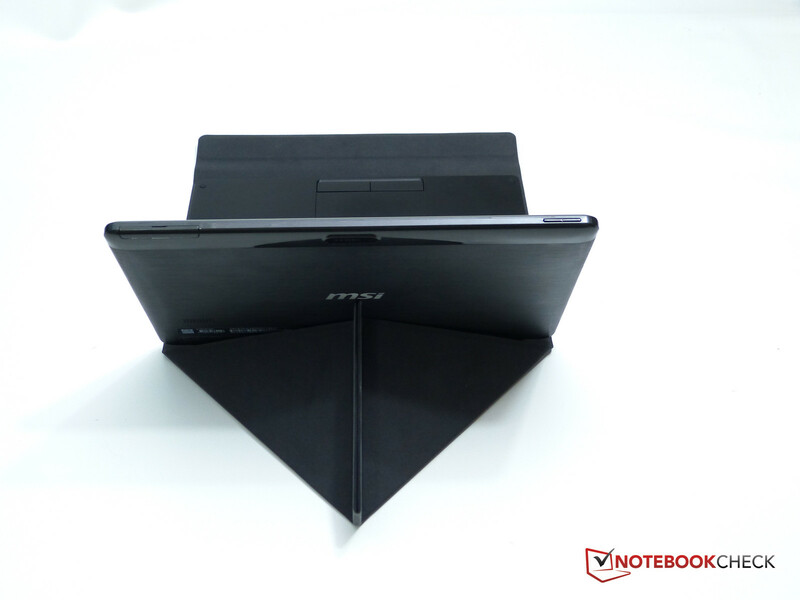 The MSI S100 could have been a really nice little lightweight 2-in-1 but it's been built to a price and it shows in some of the problems we encountered. *If* the spacebar and CPU Turbo Boost issues were just one-off issues on our test device then it's a good value travel PC that can hold a big number of photos and provide a good level of entertainment and blogging-style creativity. 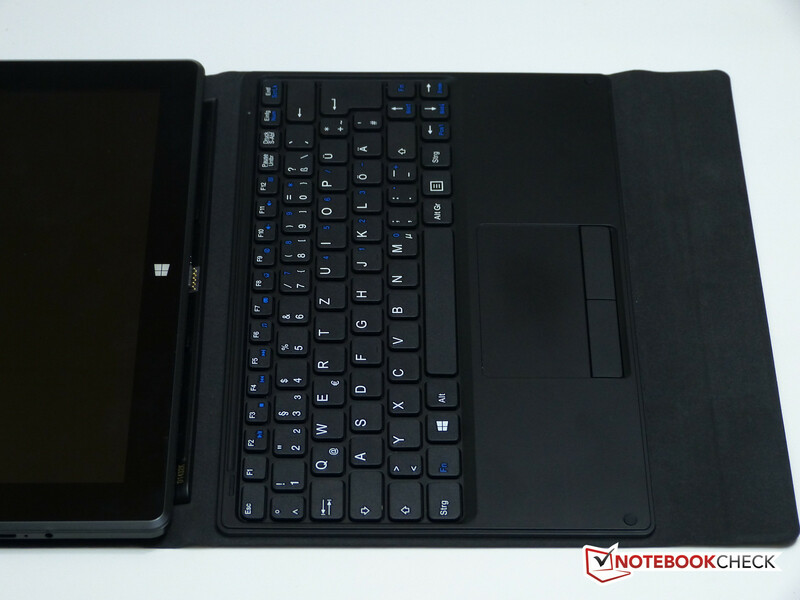 There's no way you can call the S100 a 'mini Surface Pro' though as it's in a completely different class in terms of build and performance quality. 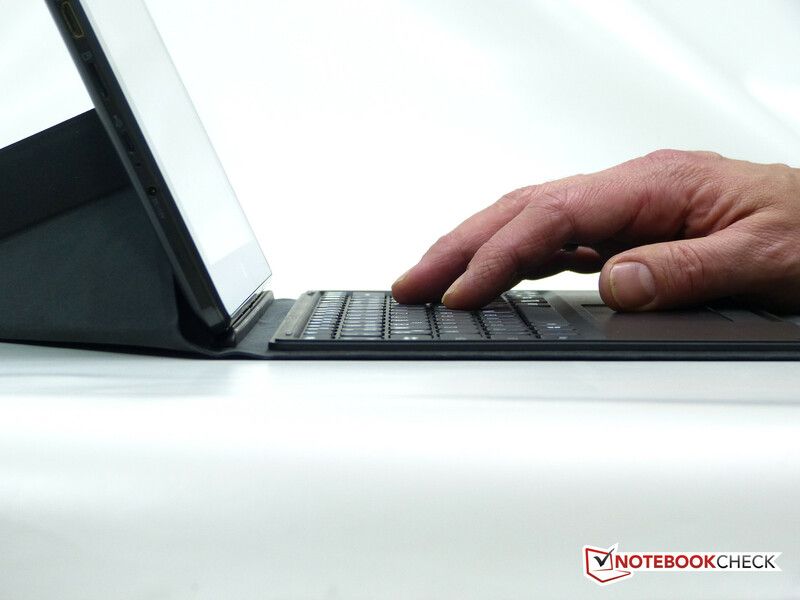 The keyboard-case design has advantages in terms of weight and device protection and we've added points for that. 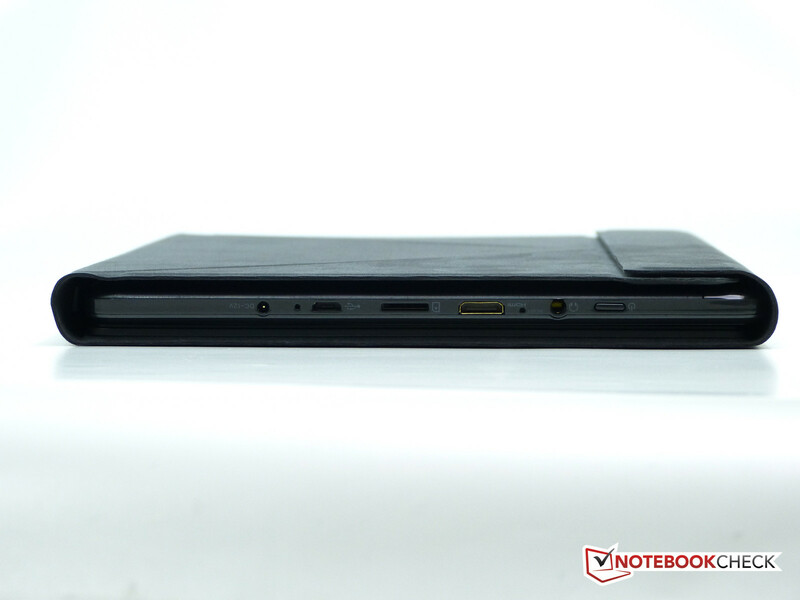 We're also happy that there's an HDMI port which means that, at a push, you could connect a proper screen and keyboard and use the S100 as a basic PC. If you've got patience you'll get some value out of the included year of Office 365 service. Ultimately this isn't an exciting 2-in-1 but could fit a number of use scenarios at the right price. It makes a good (and well protected) laptop for holidays, in-car use and for kids. The 64GB of storage allows a lot of videos and Windows Store apps to be loaded too so that adds value for those times when some basic entertainment is needed. The case stand takes a lot of area to use. Compact and light design is very portable. Problems on the keyboard and CPU Turbo Boost. 64GB storage is above average for the price.